Aggie and The Fox, Part Four: The Fox Must Hang! On December 26, 1927 on a train taking him from Pendleton, Oregon to Los Angeles William Edward Hickman confessed to the senseless slaughter of twelve year old school girl, Marion Parker. He told District Attorney Keyes, Chief of Detectives Cline, and Chief of Police Davis that “I am ready to talk. I want to tell the whole story.” The cops said later that Hickman seemed to enjoy recounting details of the kidnapping, murder, and dismemberment. Hickman admitted that he’d had no accomplice. He said that his motive for the kidnapping was to get $1500 to go to college, he claimed he wanted to go to bible school. And his motive for killing Marion? Hickman said : “I was afraid she would make a noise.” He had murdered her the day following the kidnapping. The story Hickman told was beyond comprehension. He said that he had killed Marion by strangling her with a towel. He had knotted it around her throat and pulled it tightly for two minutes before she became unconscious. Once Marion was out, Hickman took his pocket knife and cut a hole in her throat to draw blood. He took her to the bathtub and drained her body of blood. He cut each arm off at the elbow, and her legs at the knees. Her put her limbs in a cabinet. 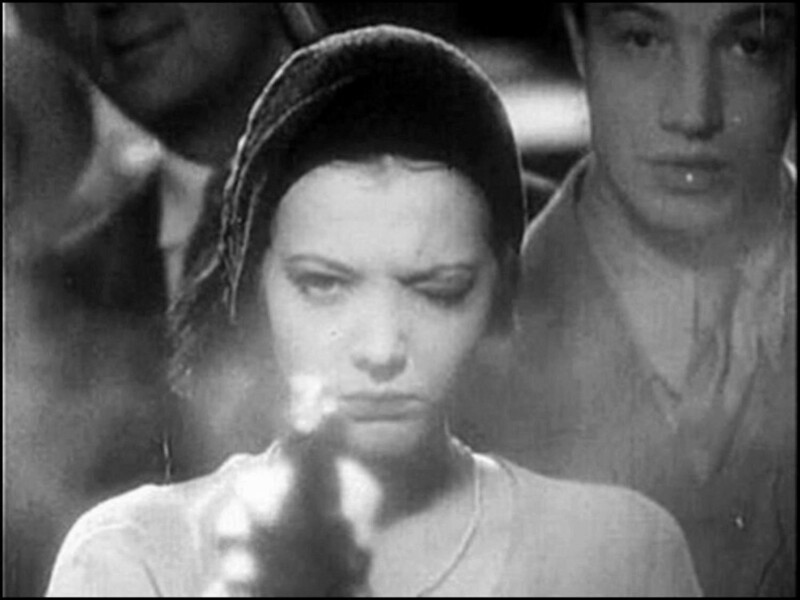 He removed Marion’s clothing and cut through her body at the waist. 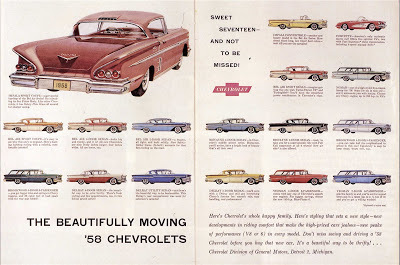 At some point during the mutilations he realized that he would lose the ransom he’d demanded if he wasn’t able to produce the kidnapped girl when he arrived at the rendezvous with her father. He wrapped the exposed ends of her arms and waist with paper. He combed her hair, powdered her face and then with a needle and thread he sewed open her eyelids. 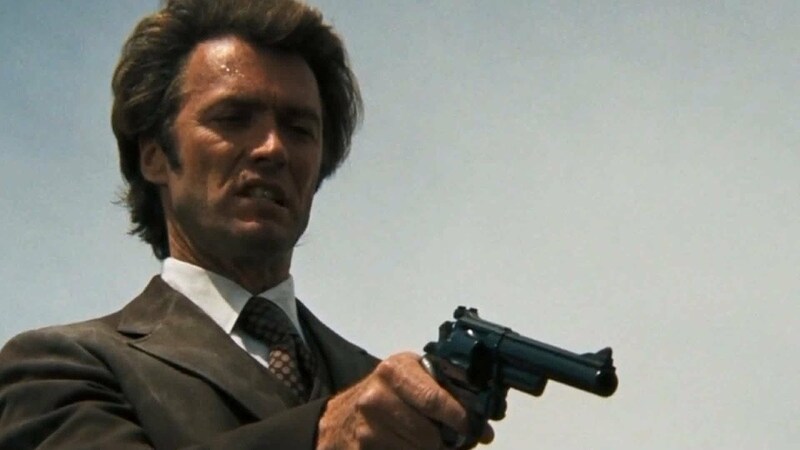 He wanted to give Perry Parker the illusion that his little girl was still alive. 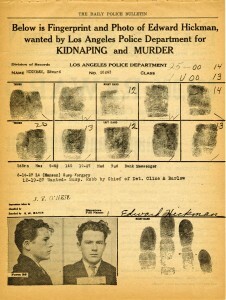 Local newspapers became obsessed with youthful perpetrators — Hickman was only nineteen. 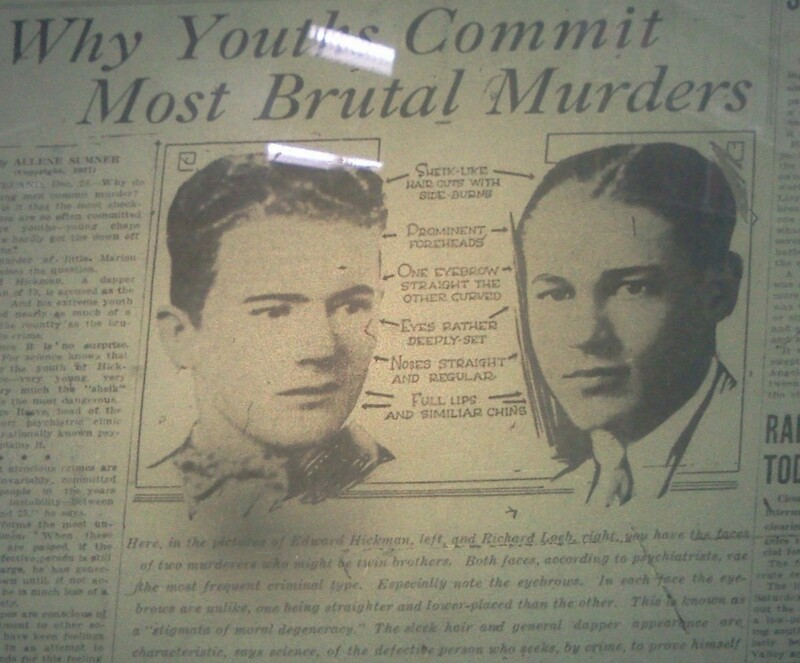 The Record (where Aggie Underwood was watching the case against The Fox unfold) published a photo of Hickman alongside one of Riichard Loeb under the headline: “Why Youths Commit Most Brutal Murders”. 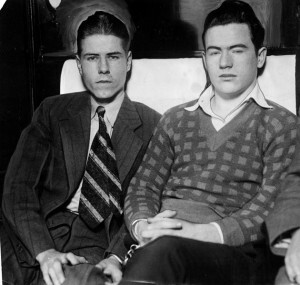 The photos of Hickman and Loeb compared their features in an attempt to reveal the outward signs of a homicidal youth. 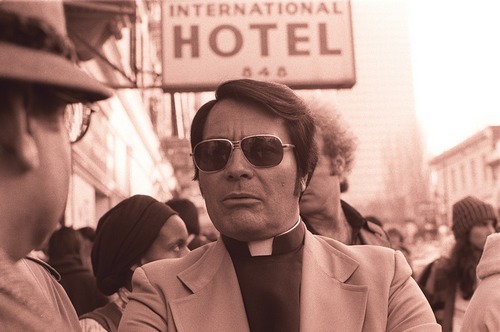 The two young men look nothing alike to me, but that didn’t keep The Record from stating that their “sheik-like hair cuts with side burns, prominent foreheads, deep-set yes, straight and regular noses, and full lips with similar chins” were signs of a killer. 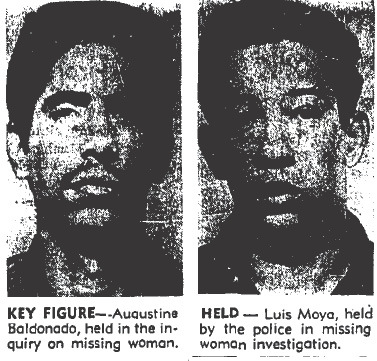 In particular the eyebrows of the young men were described as “one being straighter and lower placed than the other” which, said The Record, was known as a “stigmata of moral degeneracy”! The teenagers must have been shocked to discover that they were not exempted from ordinary laws. In fact, the two killers would have paid for the crime with their lives if not for their attorney Clarence Darrow. Darrow’s only mandate was to save them from execution, and in that he was successful. 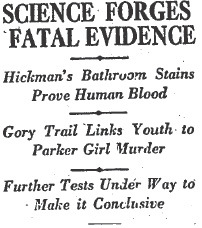 While Hickman was being tried for Marion Parker’s murder, he was also being investigated for a series of pharmacy robberies, one of which had ended in the cold-blooded killing of druggist Ivy Thoms on December 24, 1926. 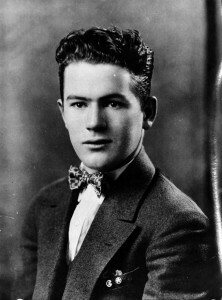 Sixteen year old Welby Hunt was eventually identified as Hickman’s accomplice and he promptly confessed to his part in the fatal drugstore robbery. His confession saved him from hanging. Nothing would save The Fox. 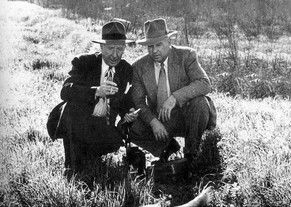 Hickman didn’t have the same advantages as Leopold and Loeb, and he wasn’t represented by Clarence Darrow. He was, according to the district attorney, “…certain to hang”. 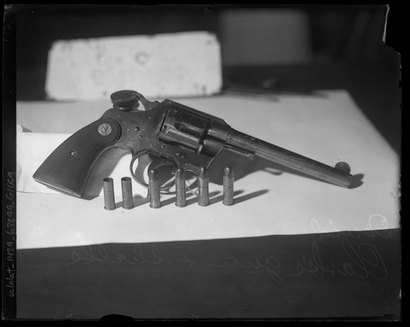 Hickman was one of the first in the state to try the newly established plea of not guilty by reason of insanity, but the jury didn’t buy it. 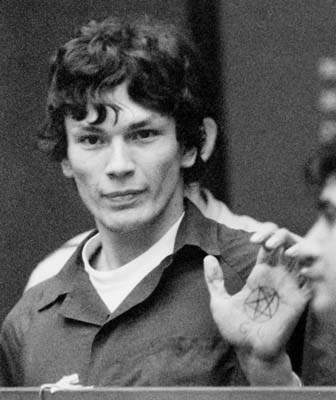 They knew he was evil, but that wasn’t the same thing as being insane. 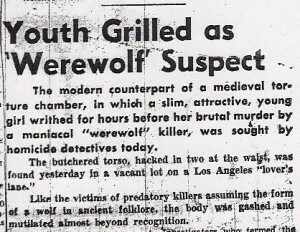 On February 14, 1928 The Record put out an extra edition with the headline ‘Fox to Hang on April 27″. Hickman and Hunt were each found guilty for the robbery/homicide and each was given a life sentence. 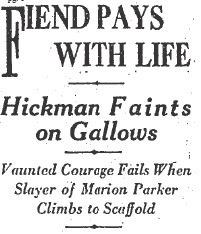 The robbery/homicide trial and the inevitable appeals on his death sentence for Marion Parker’s murder delayed Hickman’s date with the hangman, but only for a few months. On October 19, 1928 at San Quentin, William Edward Hickman was taken to the gallows where he fainted as the black hood was placed over his head. According to reports his body sagged and fell sideways He was unconscious when the hangman raised his hand and three men with poised knives behind a screen on the gallows platform drew the blades simultaneously across three strings. One of the strings released the trap and Hickman slipped through. It took fifteen minutes for him to die. There was a dispute over whether his shortened plunge caused his neck to break, or if he had strangled to death — as Marion Parker had done less than a year before. 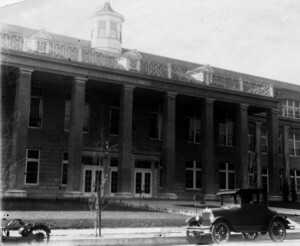 Aggie arrived at the Herald-Express city room before 7 am on a mid-January morning in 1935. Lewis S. Young, the assistant city editor, assigned the new reporter a desk, locker and an old Underwood No. 5 typewriter. In her autobiography, Newspaperwoman, Aggie said: “I didn’t foresee that the typewriter and I were to become friends on hundreds of hot stories and were not to be parted until I was ordered to the city desk twelve years later”. Lewis Young handed Aggie her first assignment; interview Amelia Earhart. 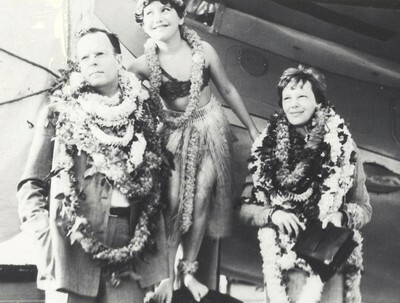 Earhart had just successfully completed a solo flight from Honolulu to Oakland and had returned to Los Angeles where she had a home in North Hollywood. 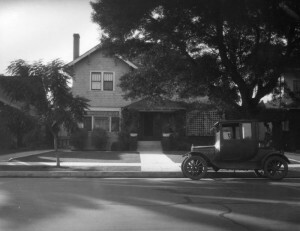 Earhart wasn’t in when Aggie arrived, and her household was being uncooperative. Aggie wasn’t about to give up, especially on her first assignment. She staked out Earhart’s home for over seven hours, occasionally she walked a few blocks to a grocery store to grab a bag of cookies and use the pay phone. When Earhart finally turned up, Aggie was able to convince her, and her mother, to pose for photographs and submit to an interview. 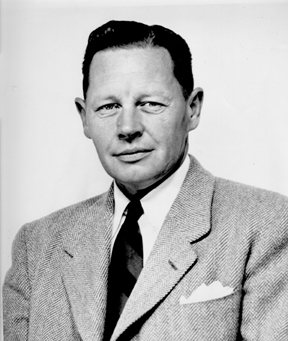 Earhart wasn’t immediately forthcoming during the interview; but through her questions Aggie managed to discover something that Earhart had not previously disclosed – that she had abandoned her plan to fly to Washington, D.C. The aviatrix also accurately predicted passenger flights from Los Angeles to Hawaii! The photographs and interview were a coup, and Aggie’s bosses at the Herald were pleased. But she wasn’t happy. 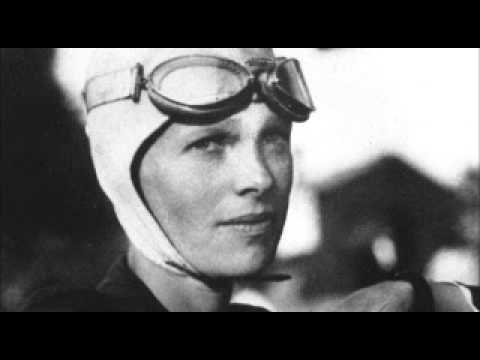 During those seven hours in front of Earhart’s home, she had suffered pangs of doubt. She’d spent years learning her craft and establishing her reputation at the Record, and she felt like she was starting over. 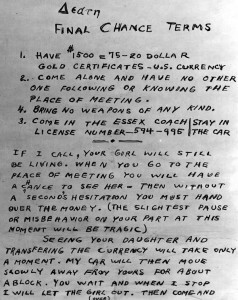 About a week after the Earhart interview Aggie decided she wanted to return to the Record, even under its new ownership. She had enjoyed the diversity of her duties at the Record, and she wasn’t sure that she’d ever feel at home at the Herald. 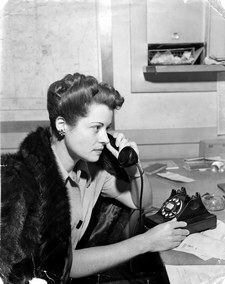 Aggie placed a call to Les Adams, managing editor of the Record, but her friend at the switchboard, Alice Gross, wouldn’t put it through. Alice told Aggie: “You don’t want to come back here. Things are in an awful fix here, Agness. I’m not going to let you talk to Les.” And she didn’t. Aggie would have to stay put. Aggie decided to express her discontent to Arthur “Cappy” Marek, the city editor who had hired her. Marek reassured her, saying: “things will work out all right; just wait and see”. Cappy convinced Aggie to give the Herald another chance. It was a decision that would challenge and reward her for the next thirty-three years. 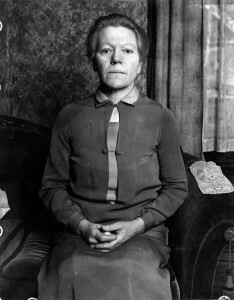 Aggie’s epiphany to interview David Clark’s parents, following his arrest for the murders of Herbert Spencer and Charles Crawford, was a brilliant blend of feminine intuition and a reporter’s gut instinct. None of her male counterparts had thought of the family angle, and so while Aggie was scoring a front page exclusive the other reporters were busy rushing down blind alleys. The front page exclusive with Clark’s parents led Aggie to yet another great interview — this one with Herbert Spencer’s widow. A friend of Aggie’s who knew the Spencers arranged the interview. Aggie was nervous; she was still an inexperienced cub reporter. She may have lacked experience, but she was also smart and determined. She made a point of reviewing everything that had been reported about the case and poked around to find holes in the coverage. Once she’d mastered the facts, she compiled a list of questions which she took with her to the interview. Aggie admitted to Mrs. Spencer that she was a cub reporter, and her honesty paid off. Herbert Spencer had been a reporter and a city editor for many years and his widow wouldn’t have been deceived if Aggie had tried to masquerade as a seasoned newshound. Mrs. Spencer answered Aggie’s questions about Herbert’s background; all the while Aggie was leading up to the hardball questions she knew she’d have to ask to get an interview worth the printer’s ink. 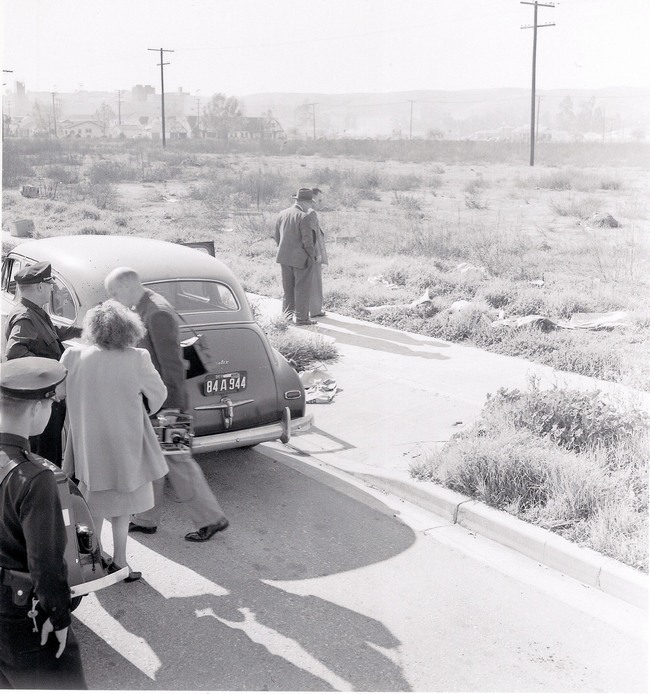 The murders of Spencer and Crawford had revealed to Angelenos some of the corruption in the city’s government. Aggie had no choice but to grill the widow Spencer about Herbert’s possible involvement in bribery, extortion, and shakedowns. Mrs. Spencer defended her husband’s reputation in no uncertain terms. She had loved him and believed in him. 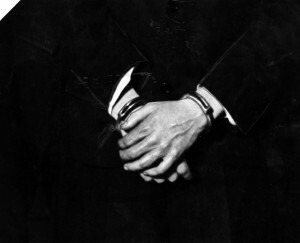 She was convinced that he’d had no part in the Combination’s illegal activities. When Aggie returned to the newsroom she was nervous about writing up the story, but Rod Brink, the city editor, told her to “just write the facts as you’ve told them to me”. 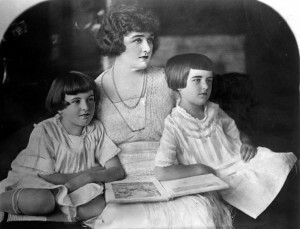 Aggie’s interview with Mrs. Spencer resulted in quotes that made the story resonate with readers who were eager to get the inside scoop. The widow told Aggie: “I was a newspaperman’s wife for fourteen years, and I loved it. He’d call and say: ‘I’ll be home late, dear, just had a peach of a murder’. 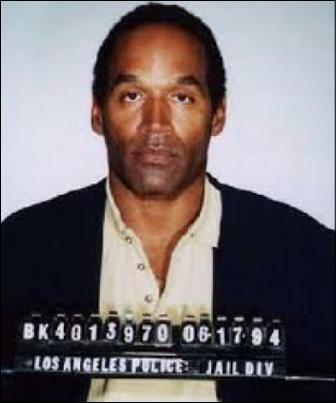 I never, never thought that his death would turn out to be a peach of a murder”. Despite her grief Mrs. Spencer expressed sympathy for the shooter’s mother! The resulting headline was: “Sorry for Dave’s Mother,’ Says Herb Spencer’s Widow”. Aggie had scored another two-line, eight-column banner at the top of page one! 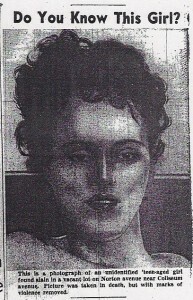 There was a photo of Mrs. Spencer over the story, with Aggie’s by-line. It wouldn’t be the last time that Aggie scooped the competition. It was an auspicious beginning to a stellar career.